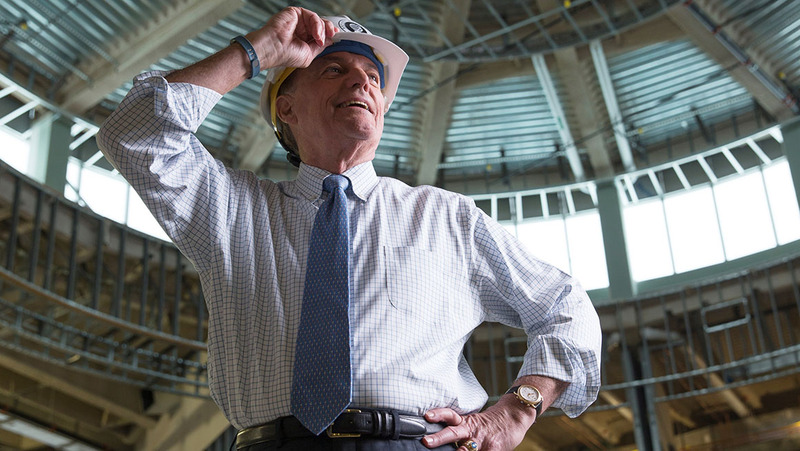 This article, a preview of the fall 2018 issue of Bryant magazine, explores the impetus for a project that placed Bryant in the vanguard of higher education. Boldly reimagining higher education and forging a model that anticipated the future, Bryant College took a transformative step in 2004, becoming Bryant University and formally integrating the studies of business and the liberal arts. 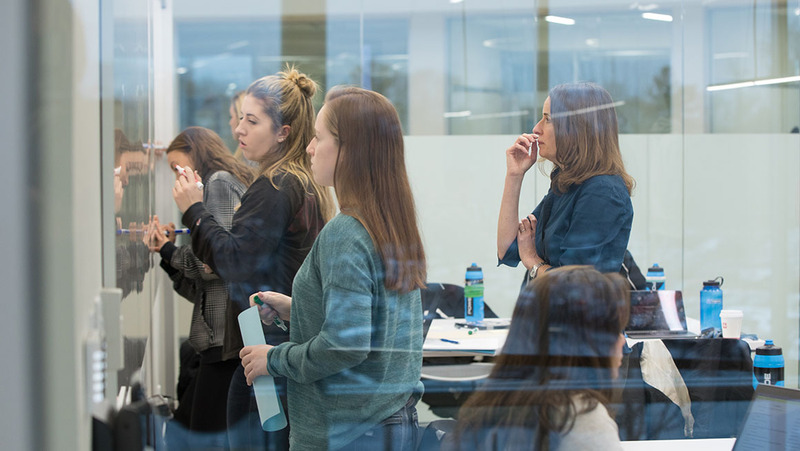 In creating the requirements of its integrated curriculum infused with real-world applications, Bryant gave students an unprecedented path to reach their full potential and achieve success in their lives and chosen professional fields. The first class to benefit from the new curriculum graduated in 2008, and, in the decade since, Bryant’s visionary curriculum has delivered an exceptional return on education investment. In 2002, the Association of American Colleges & Universities argued for an end to “the traditional, artificial distinctions between liberal and practical education." 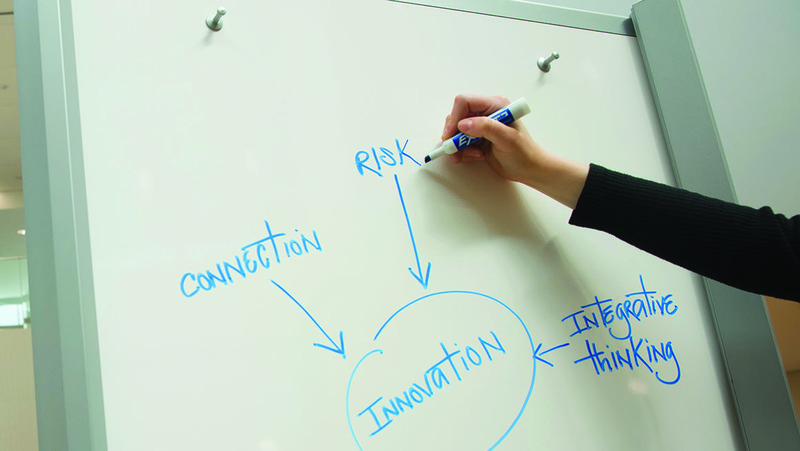 Though established in 1863 as a business school, Bryant has always offered a broad-based curriculum. A college flyer from the late 1860s listed courses in geography, poetry, and philosophy alongside classes in banking, foreign and domestic exchange, and commercial law. A 1930s course catalog describing “A Liberal Business Education” included psychology, English, economics, and public speaking. "We have consistently focused on providing the highest possible value and most relevant experience for our students." At Bryant, 2004 marked a year of significant changes, says Professor and Chair of History and Social Sciences John Dietrich, Ph.D. With the creation of the two degree-conferring colleges, Bryant required that a student’s major in one college be supplemented by a complementary minor from the other, a requirement that was groundbreaking at the time and one that remains distinctive to this day. But how should that requirement play out? Guided by a bold strategic plan, Bryant’s Curriculum Committee recognized that students would benefit from a coordinated approach to the joining of the liberal arts and business, one that would offer students a broader, richer education and lead to in-depth understanding, says Dietrich. Former Vice President for Academic Affairs V.K. Unni, D.B.A, and Finance Professor Jack Trifts, Ph.D.; and Distinguished Professor of History David Lux, Ph.D., the first deans of the College of Business and College of Arts and Sciences respectively, were crucial participants in crafting the integrated curriculum proposal. “We see the development of the two colleges as a joint venture,” Lux noted at the time. Indeed, a sense of camaraderie infused the project. The entire faculty was involved, recalls Communication Professor Mary Lyons, Ph.D., with significant input from Professor of English Joseph Urgo, Ph.D., Associate Finance Professor David Ketcham, Ph.D., and countless others. President Ronald K. Machtley agrees. 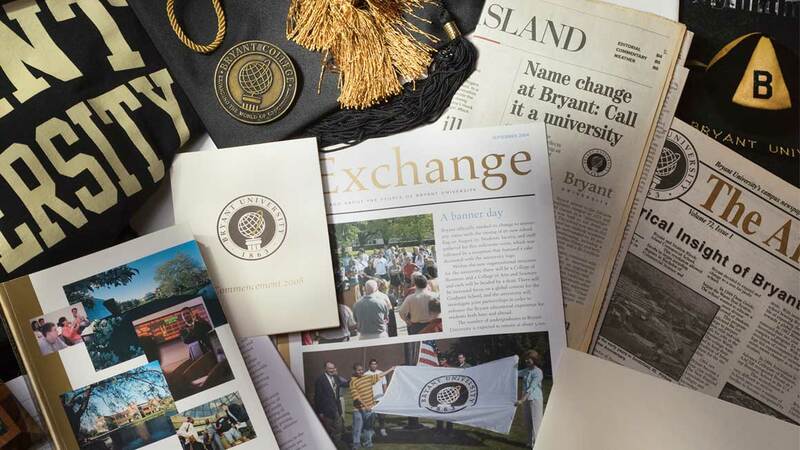 “We have consistently focused on providing the highest possible value and most relevant experience for our students, combining a first-rate academic education with opportunities to develop the character attributes that will assure their success as Bryant graduates,” he said in celebrating Bryant’s transition from college to university. Combining liberal arts and business “is like being Socrates in the morning and Steve Jobs in the afternoon." By integrating the study of business and the liberal arts, Bryant University unleashed a powerful synergy, setting itself apart from peer institutions. Few professional positions are as siloed as academic majors are, Samter says, noting that individuals with a breadth of knowledge and skills are better prepared for professional success. By completing a minor in the complementary college, liberal arts majors gain much-needed background in business that aids their marketability and provides knowledge of the professional sphere. And for business students who minor in one of the liberal arts? They gain a broader perspective, critical thinking skills, and a fuller sense of the world. The fascinating combinations of liberal arts and business subjects that students assemble – and how they use them – consistently impress Lyons. 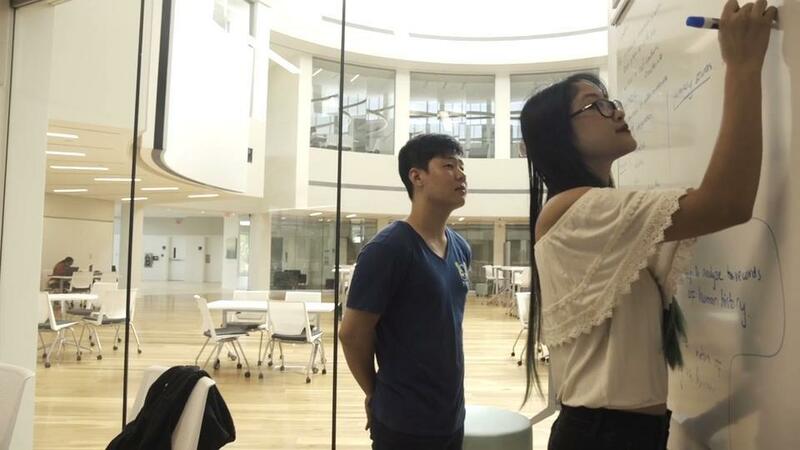 “They appreciate the idea that sometimes it’s their minor that ultimately makes their resume look different, or they come to love their minor, which becomes their focus for graduate school or their career path,” she says. Since 2004, Bryant’s path has enjoyed a wave of support. A national study published in 2012 by the Carnegie Foundation for the Advancement of Teaching found that most undergraduate business schools' curricula were still too narrow, failing to challenge students to question assumptions, think outside the box, and recognize the business role in the larger arena. The foundation’s recommendation – integrate the best elements of liberal arts with business – endorsed the ideas behind Bryant’s forward-looking curriculum integration. “Business and liberal learning must be woven together to prepare students for their professional roles and work and also to prepare them for lives of social contribution and personal fulfillment,” the study stated. “Executives and hiring managers place a high priority on graduates’ demonstrated proficiency in skills and knowledge that cut across majors." As calls from employers for individuals who can marry liberal arts and business skills grow louder, Bryant students and alumni see the benefits of the integrated curriculum firsthand as organizations eagerly recruit Bryant students for internships and jobs. When hiring, “executives and hiring managers place a high priority on graduates’ demonstrated proficiency in skills and knowledge that cut across majors,” the report noted. Both groups, the report said, placed high value on oral communication, critical thinking, ethical judgment, and written communication. 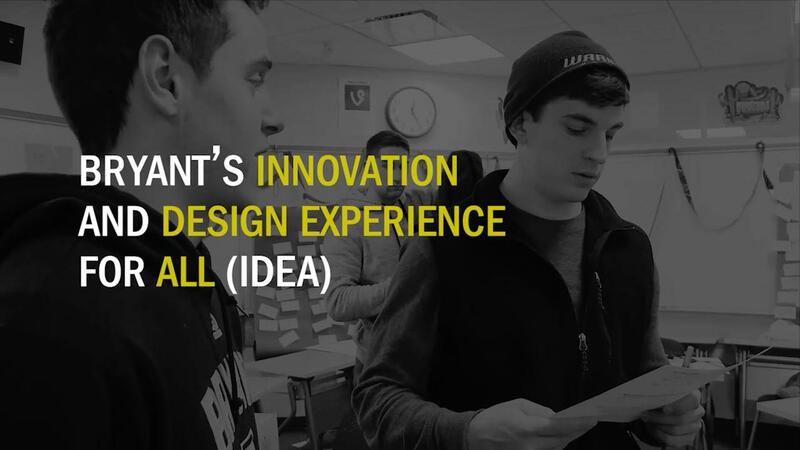 The evolution of Bryant's integrated curriculum continues with such additions as the nationally recognized First-Year Gateway, Sophomore International Experience, and the design-thinking immersion program known as IDEA – Innovation and Design Experience for All. 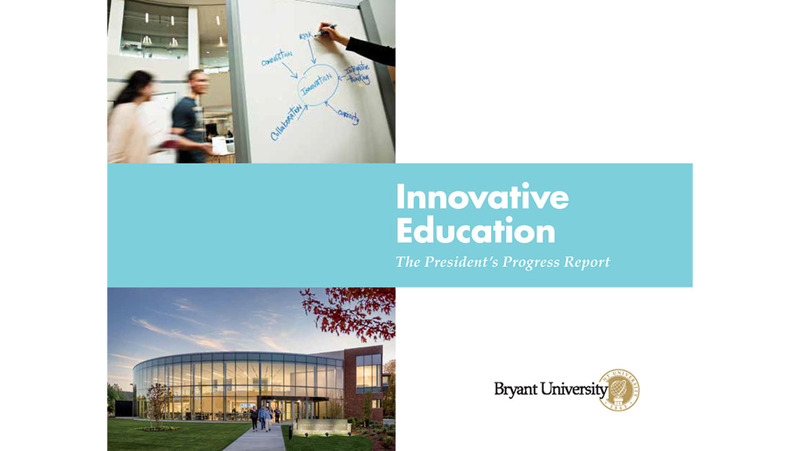 Through these initiatives, Bryant remains ahead of its peers in ensuring the education of the whole person by preparing students to explore and appreciate new ideas, solve big problems, and find personal as well as professional success.